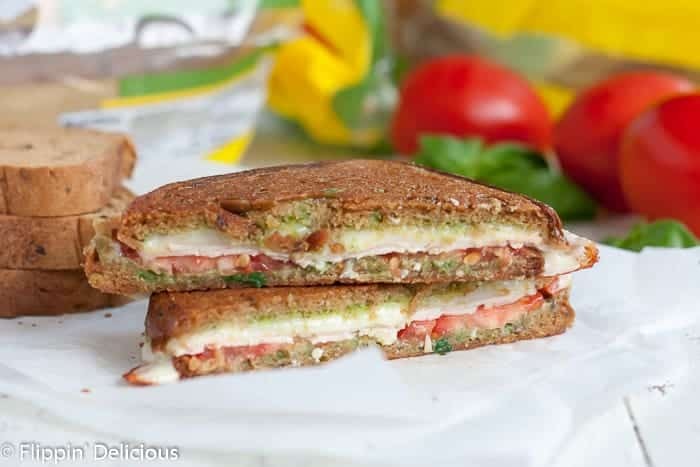 Gluten Free Caprese Panini has all the flavors of your favorite summer salad between two slices of golden, buttery gluten free bread. This post is sponsored by Schär and their new 10 Grain and Seeds bread. As always, all opinions are entirely my own. Thank you for supporting Flippin’ Delicous™ and the companies I work with. 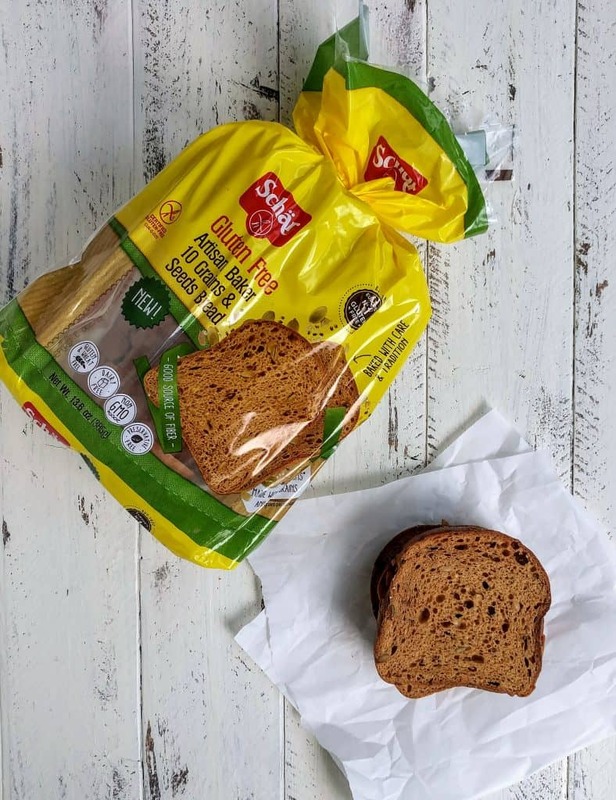 I have a $2 off Schär coupon you can use to save on the new 10 Grain and Seeds bread, or on one of your old favorites. I don’t remember how I learned what panini was. At some point when I was a teenager, I found a recipe for panini and was very intrigued by the concept. Our family didn’t have a panini press, so instead a made several grilled cheese paninis using our heart-shaped waffle iron. A few years later when my husband and I were first dating we drove north to Angel Fire New Mexico and went skiing. I had only been once before, and I don’t know that he had ever been skiing. It was probably really funny to watch us fall down over and over. One fond memory from that trip was pulling some Roma tomatoes and provolone paninis out of my snow pants pocket for lunch. We ate them cold. With such fond panini memories, it shouldn’t be surprising it was the first thing I wanted to make after I tried Schär’s new 10 Grains and Seeds bread. It is sweetened with honey and agave, is made with 10 different grains and seeds (just as the name implies), is a good source of fiber, and has a unique sourdough recipe. It is just plain tasty! 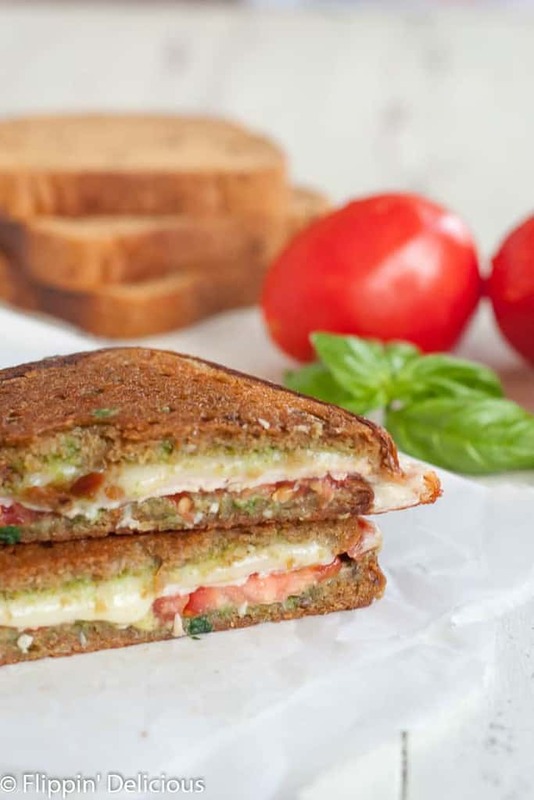 Especially when combined with pesto, tomatoes, chicken, and provolone and grilled until golden to create a gluten free Caprese panini. I also love that Schär’s bread stays fresh at room temperature until it is opened. It is nice to not have extra loaves of bread taking up my tiny freezer space. When I got into the kitchen to create this chicken pesto panini I remembered I don’t have a panini press. I didn’t let that stop me from getting my panini on! Grilling my sandwich in a skillet, I placed a piece of tinfoil on top, and placed a heavy saucepan on top to press it. I cooked it for a few minutes, flipped it, and cooked it on the other side (replacing the tinfoil and heavy saucepan. The result was perfectly cheesy, crisp, fresh panini. The tomato, basil pesto, and creamy provolone reminded me of one of my favorite summer salads, Caprese salad. With all the same summer flavors sandwiches between buttery bread. Get a $2 off Schär coupon to use on any product. 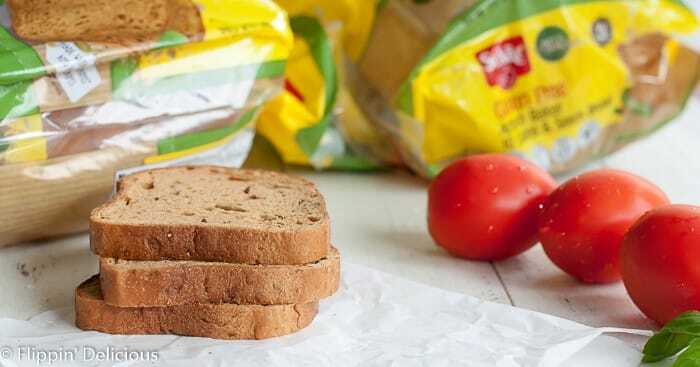 Try the new 10 Grain and Seeds bread, or an old favorite. Gluten Free Caprese Panini has all the flavors of your favorite summer salad between two slices of golden, butter, gluten free bread. Spread the inside of each slice of bread with pesto. Layer on the tomatoes, chicken, and cheese, then top with the other slice of bread. *Grill in your panini press according to your appliances' directions. *Place the sandwich on your waffle iron and grill until the outside is golden and the cheese is melted. How long that depends on your waffle iron, anywhere from 2-5 minutes. *Grill in a skillet, place a piece of foil on top of the sandwich and then press it with a heavy-bottomed saucepan. Cook for 2-3 minutes on each side. 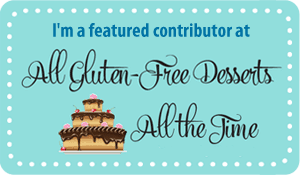 This gluten free bread looks great and the sandwich…yum!Thanks for posting this!